One president, three ministers; Russia Franz Josef Land got unusual guests from Moscow. Prime Minister Dmitry Medvedev was flying to Aleksandra Land via the airport in Murmansk. Together with President Vladimir Putin and Minister for Natural Resources Sergey Donskoy, Medvedev went to see the results of the work on removal of hazardous waste, the portal of the Russian Government reports. Most of the waste was left behind by Soviet military decades ago. Also Minister of Defense Sergey Shoigu and the President’s special representative on environmental protection, ecology and transport, Sergey Ivanov, were traveling with the President, Kremlin reports. Never before has the remote Russian archipelago had such high-ranking official visitors at the same time. In 2012, the President Putin signed a decree on a major clean-up in the Arctic, including at Franz Josef Land. Before the clean-up started, there was as much as 90,000 tons of scrap metal on Franz Josef Land alone. Thousands of tons of scrap metal is also scattered over a number of the other Russian Arctic archipelagos. According to Russia’s Natural Resource and Ecology Minister, Sergey Donskoy, the Island of Alexandra is now fully swept clean of rusting barrels from the Soviet era. 2017 is officially the Year of Ecology in Russia. This is Putin’s second visit to Franz Josef Land. 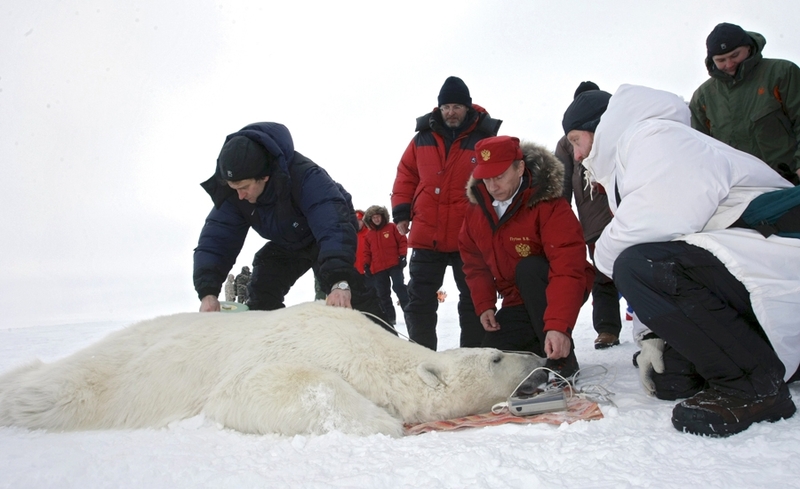 First time, in April 2010, the President announced his Polar Bear Programme, one of several special animal protection projects initiated by Putin. Putin will after the visit to Franz Josef Land fly to Arkhangelsk where he on Thursday will give a speech at the Arctic Forum conference. Franz Josef Land was last year included in the Arctic National Park, aimed at protecting the vulnerable Arctic ecosystem. The park, that earlier only covered the northern parts of Novaya Zemlya, now covers an area of 8,8 million hectares making it the biggest protected nature reserve in Russia. Franz Josef Land includes nearly 200 islands. On Aleksandra Land, the westernmost island, has recently got new military infrastructure, in addition to the upgraded airport.